In recent years under floor heating has widely been accepted as one of the most effective methods of heating. It has become the fastest growing market for both domestic and commercial heating sectors. Huge investments in new technical developments with the suppliers and developers, architects, main contractors and sub-contractors are leading the market. In Europe, construction market is still recovering from the global financial crisis a decade ago. The gradual recovery of European building and construction markets is anticipated to continue throughout and supporting the underfloor heating market to flourish. Goldstein Research analyst forecast the under floor heating market size is set to reach USD 4.6 billion by 2024 from the USD 2.3 billion in 2016, growing at a CAGR of 9.1% over the forecast years. With the increased understanding of the application of under floor heating systems that it covers larger area as compared to other methods of keeping the space warm such as forced air heating method. Colder regions especially in temperate and frigid zone of the earth require efficient and reliable system to keep the indoor areas warm. The report covers the present ground scenario and the future growth prospects of the under floor heating market for 2016-2024 along with the sales and revenue of the under floor heating system. We calculated the market size and revenue share on the basis of revenue generated from major players and sales of under floor heating from major players across the globe. The report describes the market on the basis of front-end equipment, back-end equipment and fabrication facility equipment. 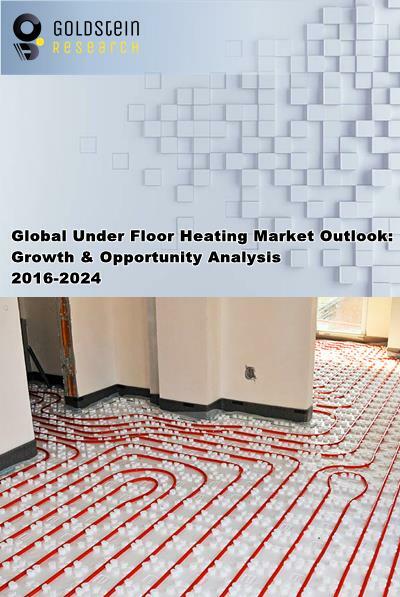 In addition the raw material and manufacturing equipment suppliers, OEMs, technology investors, Governments, financial institutions, and investment communities and end users of the under floor heating market data is covered in the report. On the basis of heating method, hydraunic under floor heating segment market share was 38.7% in 2016. Hydraunics under floor heating systems are preferred owing to its lower cost of installation, efficient and less energy consumption and it is suitable with most of the flooring types, hence it is expected to grow annually at the rate of 4.3%. Sensors and thermostat market segment is expected to grow at a CAGR of 4.2% because the productivity of under floor heating system is dependent upon the sensors and thermostat which measures the physical characteristic of an environment and provides signal corresponding to the properties. Under floor heating market outlook 2016-2024, has been prepared based on an in-depth market analysis from industry experts. The report covers the competitive landscape and current position of major players in the under floor Heating market. The report also includes porter’s five force model, SWOT analysis, company profiling, business strategies of market players and their business models. Global Under floor heating market report also recognizes value chain analysis to understand the cost differentiation to provide competitive advantage to the existing and new entry players. With the advancement in technology, there is a trend of using smart underfloor heating that saves the cost and efforts to regulate the temperature and is efficient way of installing under floor heating systems. It uses the Wi-Fi connected with smart phones to control and regulate the temperature. Also it learns through routine and senses automatically when to change the temperature. According to the report, major driving factor for the growth of under floor heating market is the average temperature of a region as well as housing and construction industry of that region that allows for the installation of under floor heating systems. Further, there are many challenges associated with the under floor heating but major challenge is the political unrest around the European countries. Europe being the largest market, any disruptions in the European economy such as Brexit and European climate such as global warming impacts, will affect the demand of under floor heating systems. Based on geography, North America is expected to remain on the growth path but at a slow rate owing to the fact that U.S. construction industry is becoming favorable and the government is also boosting infrastructure and manufacturing investments. Thus, North America had 32.5% market share of the global underfloor heating market in 2016 and is expected to grow at the rate of 4.6% CAGR. Europe has the largest market share i.e. 51.45% of the total underfloor heating market due to the presence of maximum countries under the influence of frigid or temperate zone and the housing permit trend is reasonably strong in most European countries such as Germany, the Netherlands, France and some Nordic countries. Global Under floor heating market report comprises of the following companies as the key players in the under floor heating market: Honeywell International, Mitsubishi Electric Corporation, Schneider Electric SE, Siemens AG, Nexans S.A., Pentair PLC. Other high-flying vendors in the under floor heating are: Uponor, WMS Underfloor Heating, Danfoss A/S, Emersion Electric Co., Robert Bosch. What is the revenue of under floor heating market in 2015-16 and what would be the expected demand over the forecasted period?